More than two-thirds of the Student Association Senate voted Monday to impeach Sen. Joe Vogel, U-at-Large, for failing to show up to meetings. 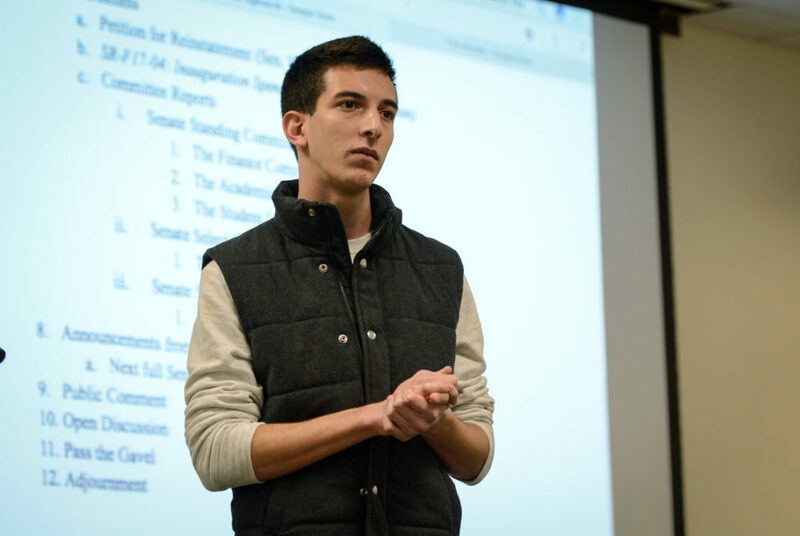 The Student Association Senate voted Monday to impeach a senator for failing to show up to meetings. Sen. Joe Vogel, U-at-Large, was removed from his post after more than two-thirds of the senate found him guilty of missing four consecutive committee meetings in the fall, enough absences to force him out of his position. At the hearing, which was not open to the public, 22 out of 29 senators present voted to remove Vogel, Executive Vice President Sydney Nelson said. Vogel is the first SA senator to be impeached in at least three years. He was intially suspended in November, and senators voted not to reinstate him later that month. The impeachment vote came after Vogel apologized for missing the meetings in a letter sent to senators earlier Monday. He said in the letter that he believed the effort to remove him was based on “personal political agendas” because there was no precedent for removing a senator for missing committee meetings. After the hearing Monday, Vogel said three senators – Brady Forrest, G-at-Large, Imani Ross, U-at-Large and Devan Cole, CCAS-U – had launched a successful effort to kick him out of the SA, which he said was linked to his pro-Israel political views. Vogel was one of the leaders of “GW Together,” a movement that mobilized last spring in opposition to an SA resolution calling on the University to divest from companies that contribute to human rights abuses against Palestinians. Members of the group said the resolution was meant to target Israel and encouraged its supporters to pack SA meetings and lobby senators to defeat it. The resolution failed by one vote in April after hours of contentious debate. Forrest, Ross and Cole all supported the resolution, but none of them co-sponsored it. “It’s not a surprise to me that the senators most closely aligned with the BDS movement on campus have made it their mission to remove an openly pro-Israel student from the senate in an effort to silence an opinion,” Vogel said, referring to the Boycott, Divestment and Sanctions movement, an effort that has been accused of anti-Semitism. “It is unfortunate that former Senator Vogel continues to seem incapable of taking responsibility for his actions and would rather make accusations towards senators who are only doing what is required of them by the SA bylaws,” he said in an email. Forrest called accusations that senators deliberately rejected pro-Israel candidates an “irresponsible mischaracterization of what happened.” He added that the governance and nominations committee, which considers candidates for senate vacancies, put forward a diverse group of candidates for consideration by the full senate, though he did not directly respond to accusations of being anti-Israel. Cole said the impeachment had “everything to do” with the SA bylaws and that he was only one of 22 senators to vote to remove Vogel. “I did my job, and based on the evidence and on the actual violation, I thought that it made sense to bring someone on who could do the job and advocate for students in a better way,” he said. He also did not respond to accusations of holding anti-Israel views. Ross did not immediately return a request for comment. Prior to Monday’s hearing, some senators said Vogel had been disruptive at meetings that he did attend and did not apologize to senators for missing meetings until the day of the vote. In the fall, a senator who had violated the SA’s attendance policy was reinstated to his role. In 2016, seven SA senators were suspended for regularly missing meetings as part of a move to enforce attendance rules. Vogel’s seat is now vacant and will be filled through the SA’s vacancy application process.